With up to 12 hours of protection, you can trust the original design of Poise Ultimate Absorbency, Long Pads to handle unexpected gushes from light bladder leakage. Poise incontinence pads offer the trusted 3-in-1 protection for dryness, comfort, and odor control. Prevent leaks and quickly lock away wetness with Leak-Block Sides and an Absorb-Loc Core. Poise Pads feel comfortable and stay 10x drier than leading period pads and can be used as a postpartum pad or maternity pad for women after birth who experience heavier bladder leakage. This package contains individually wrapped Poise Ultimate Absorbency Incontinence Pads in long length. Poise is the number one brand for light bladder leaks. Based on Nielsen Market Share Data Based on Nielsen Market Share Data Frequently Asked Questions What is LBL? LBL stands for light bladder leakage, and it affects millions of women. In fact, 1 in 3 women experience light bladder leakage (LBL), which is the frequent involuntary leakage of urine. Why do I have bladder leaks? Some of the most common reasons for uninvited leaks include: Physical changes from childbirth to menopause. Being overweight. Complications from surgery, stroke, or chronic diseases. Bladder or urinary tract infections. Bladder irritants. Can I prevent leaks? There are healthy habits you can maintain in order to help prevent leaks. Track your triggers Look for patterns in how your bladder reacts to certain spicy and acidic foods and beverages. Exercise regularly - Reduce leaks by strengthening the muscles of your pelvic floor. Drink more water Drink six to seven 8-ounce glasses of water a day to prevent irritation. Can I use my FSA? Yes, you can. Poise products are FSA-eligible only applicable in the US. Will my shipping box have what s inside written on it? No, it will not. All Poise maternity pads, bladder control pads and other incontinence products are shipped discreetly in a brown, corrugated box for your privacy. As Poise s most absorbent pad with a 75% wider back , Poise Overnight Incontinence Pads for women give you the extra protection you need while lying down. This overnight bladder control pad quickly locks away moisture and helps prevent nighttime leaks so you can rest without interruption perfect for women who use stress incontinence pads or need maternity pads after giving birth. Best of all, the back of the pad is 75% wider to provide you more coverage than any other overnight LBL pad. Save up to 15% with Amazon s Subscribe & Save to ensure you never have a night without the protection of Poise. 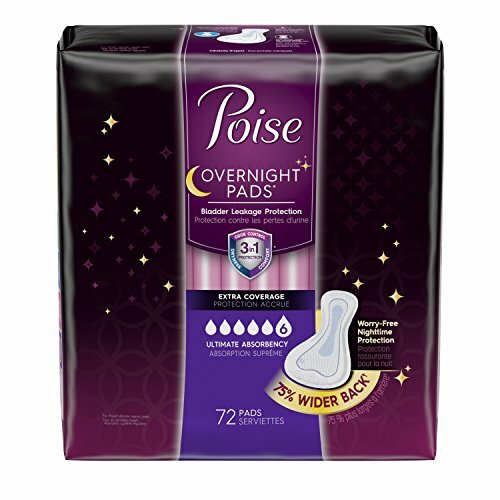 Stop heavy bladder leaks or surge incontinence from disturbing your sleep with Poise Overnight Pads. vs. Poise Ultimate Regular 75% wider back for the most protection vs. Poise Ultimate Regular Locks away wetness and odor with Absorb-Loc Helps prevent nighttime leaks with Leak-Block sides Regular fit measures a length of 16.2 in (40.5 cm) FSA-eligible (only applicable in the U.S.) Ships in discreet packagingFrequently Asked Questions What is LBL? LBL stands for light bladder leakage, and it affects millions of women. In fact, 1 in 3 women experience light bladder leakage (LBL), which is the frequent involuntary leakage of urine. Why do I have bladder leaks? Some of the most common reasons for uninvited leaks include: Physical changes from childbirth to menopause. Being overweight. Complications from surgery, stroke, or chronic diseases. Bladder or urinary tract infections. Bladder irritants. Can I prevent leaks? There are healthy habits you can maintain in order to help prevent leaks. Track your triggers Look for patterns in how your bladder reacts to certain spicy and acidic foods and beverages. Exercise regularly Reduce leaks by strengthening the muscles of your pelvic floor. Drink more water Drink six to seven 8-ounce glasses of water a day to prevent irritation. Can I use my FSA? Yes, you can. Poise products are FSA-eligible only applicable in the U.S. Will my shipping box have what s inside written on it? No, it will not. All Poise maternity pads, bladder control pads and other incontinence products are shipped discreetly in a brown, corrugated box for your privacy. 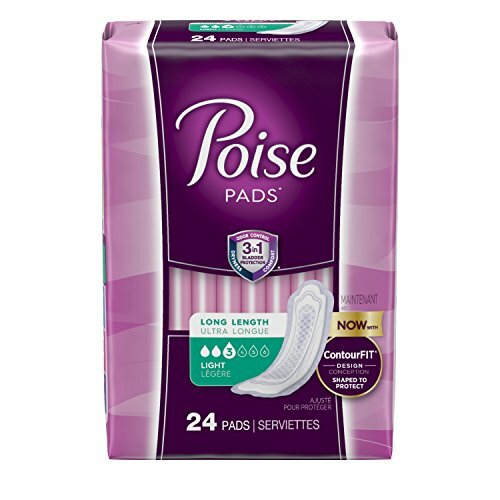 Brand: Poise | Manufacturer: Kimberly-Clark Corp.
With trusted 3-in-1 protection for dryness, comfort and odor control, Poise Incontinence Pads softly curve in the middle to give you the confidence and protection you need for heavy bladder leakage protection. The front and back of the incontinence pads are wider to provide even more coverage where you need it the most, while the middle conforms to your natural body curves. Poise pads stay 10x drier than leading period pads. Poise Maximum Absorbency Incontinence Pads are designed to handle those unexpected surges. This package contains individually wrapped Poise Maximum Absorbency Incontinence Pads in long length. Poise is the number one brand for light bladder leaks. Based on Nielsen Market Share DataFrequently Asked Questions What is LBL?LBL stands for light bladder leakage, and it affects millions of women. In fact, 1 in 3 women experience light bladder leakage (LBL), which is the frequent involuntary leakage of urine. Why do I have bladder leaks? Some of the most common reasons for uninvited leaks include: Physical changes from childbirth to menopause. Being overweight. Complications from surgery, stroke, or chronic diseases. Bladder or urinary tract infections. Bladder irritants.Can I prevent leaks? There are healthy habits you can maintain in order to help prevent leaks. Track your triggers Look for patterns in how your bladder reacts to certain spicy and acidic foods and beverages. Exercise regularly - Reduce leaks by strengthening the muscles of your pelvic floor. Drink more water Drink six to seven 8-ounce glasses of water a day to prevent irritation.Can I use my FSA? Yes, you can. Poise products are FSA-eligible only applicable in the U.S. Will my shipping box have what s inside written on it? No, it will not. All Poise maternity pads, bladder control pads and other incontinence products are shipped discreetly in a brown, corrugated box for your privacy. With trusted 3-in-1 protection for dryness, comfort and odor control, Poise Moderate Absorbency Incontinence Pads now have a new ContourFit design to give you the confidence you need day or night for superior incontinence protection. The front and back of the incontinence pads are wider to provide even more coverage where you need it the most, while the middle features a soft curve that will better conform to your natural body curves. 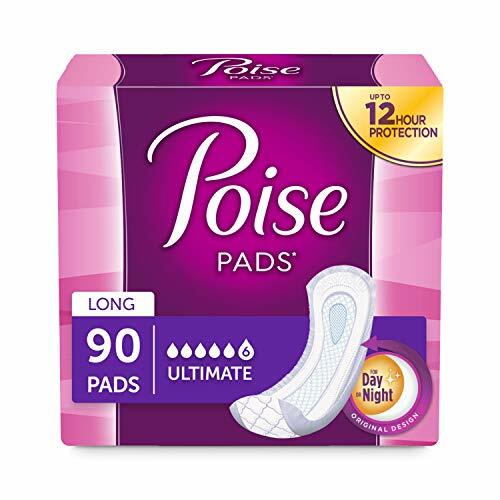 Poise pads fit you better than before and stay 10x drier than leading period pads. Poise Moderate Absorbency Incontinence Pads are designed to handle those unexpected surges. This package contains individually wrapped Poise Moderate Absorbency Incontinence Pads in regular length. Poise is the number one brand for light bladder leaks. Based on Nielsen Market Share Data Frequently Asked Questions What is LBL? LBL stands for Light Bladder Leakage, and it affects millions of women. In fact, 1 in 3 women experience Light Bladder Leakage (LBL). LBL is the frequent involuntary leakage of urine. Why do I have bladder leaks? Some of the most common reasons for uninvited leaks include: Physical changes from childbirth to menopause. Being overweight. Complications from surgery, stroke, or chronic diseases. Bladder or urinary tract infections. Bladder irritants. Can I prevent leaks? There are healthy habits you can maintain in order to help prevent leaks. Track your triggers Look for patterns in how your bladder reacts to certain spicy and acidic foods and beverages. Exercise regularly - Reduce leaks by strengthening the muscles of your pelvic floor. Drink more water Drink six to seven 8-ounce glasses of water a day to prevent irritation. Can I use my FSA? Yes, you can. Poise products are FSA-eligible only applicable in the US. Will my shipping box have what s inside written on it? No, it will not. All Poise maternity pads, bladder control pads and other incontinence products are shipped discreetly in a brown, corrugated box for your privacy. Get bladder leak protection you can depend on with Always Discreet Pads. Secure bladder protection for sensitive bladders in an incontinence pad you can barely feel, these super absorbent pads have a RapidDry core that turns liquid to gel to lock away bladder leaks and odors. OdorLock Technology neutralizes odors and helps keep you feeling fresh all day. Double LeakGuards help keep wetness away from edges for secure bladder protection. Always Discreet Incontinence Pads absorb 4X more than period sanitary pads of similar size and are ideal for overactive bladders. Each incontinence pad is individually wrapped for discreet disposal on the go. With their thin design, you ll be able to walk with poise while keeping your incontinence protection discreet. 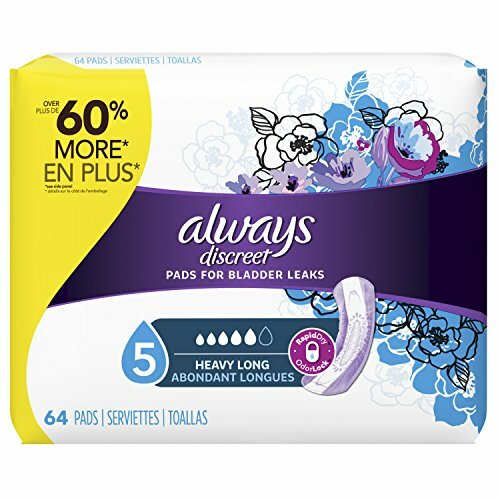 Always Discreet also offers Incontinence Liners and Incontinence Underwear. 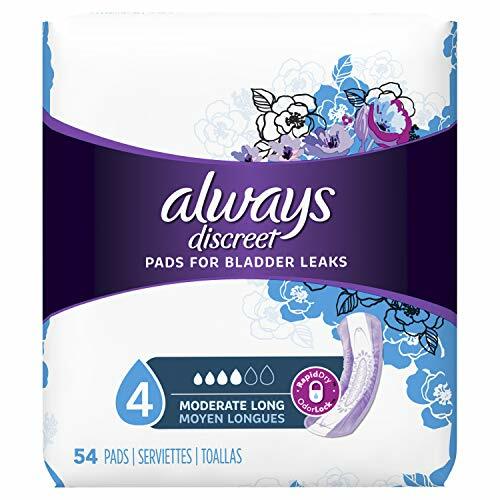 Get bladder leak protection you can depend on with Always Discreet Liners. These super absorbent liners have a RapidDry core that turns liquid to gel to help lock away bladder leaks and odors in seconds. With their thin design, you ll be able to walk with poise while keeping your incontinence protection discreet.. Stop Use Indications- To avoid danger of suffocation, keep this plastic bag away from babies and children. Instructions- To Use- Remove liner from disposable wrapper, apply liner to underwear. To Dispose: Remove liner from underwear, wrap in disposable wrapper, throw in trash. Do not throw liner in toilet. Sleep confidently and soundly through the night with Tena Overnight Incontinence Pads for Women. These pads feature Lie Down Protection with a design that is longer and wider at the front and the back for better protection while you sleep. A soft top sheet and super-absorbent Dry-Fast Core quickly absorb and lock in urine. Additionally, they are pH balanced to neutralize odor, not mask it. Cushiony side gathers conform to your body for a comfortable fit, with an adhesive strip for added security. Designed to protect against moderate to heavy leakage, Tena Overnight Incontinence Pads for Women offer superior protection so you can sleep without worry. If your flow is slowing you down, it s time to rethink your period protection. 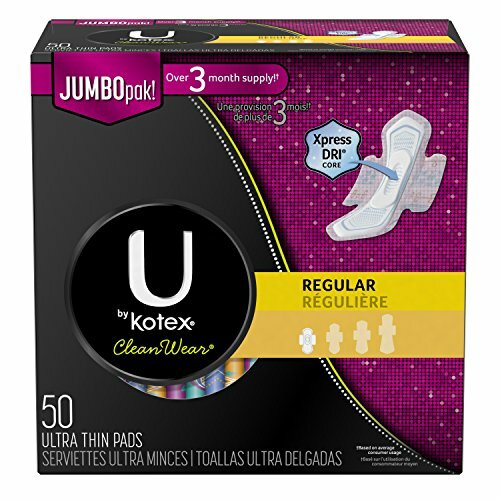 U by Kotex CleanWear Ultra Thin Pads with Wings have the Xpress DRI Core that quickly draws in and locks away wetness. The uniquely shaped Tru-Fit wings help keep this feminine pad in place to prevent bunching so it keeps up with you and your flow. These regular absorbency pads are designed with super soft sides to help you move with comfort and ease. These sanitary napkins are lotion-free and fragrance-free. Each pad is individually folded in an easy-open wrapper with four colorful designs. For a nighttime period pad solution, check out U by Kotex AllNighter Ultra Thin Overnight Pads with Wings. Solimo Incontinence Pads for Women locks in 20% more wetness than leading bladder control pads. Dual odor control system effectively helps neutralize and stop odors to keep you feeling fresh throughout the day. Dri-Fit helps to control moisture and temperature to help your skin stay dry, comfortable and healthy. 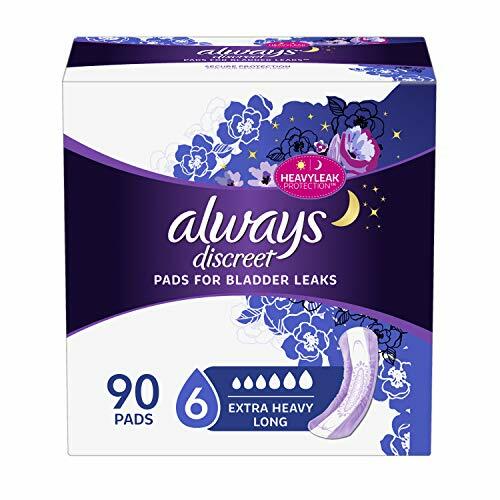 Get bladder leak protection you can depend on with Always Discreet Pads. These super absorbent incontinence pads have a Rapid Dry core that turns liquid to gel to help lock away bladder leaks and odors in seconds. With their thin design, you'll be able to walk with poise while keeping your incontinence protection discreet. Ultimate Overnight is changing names to Extra Heavy Long. 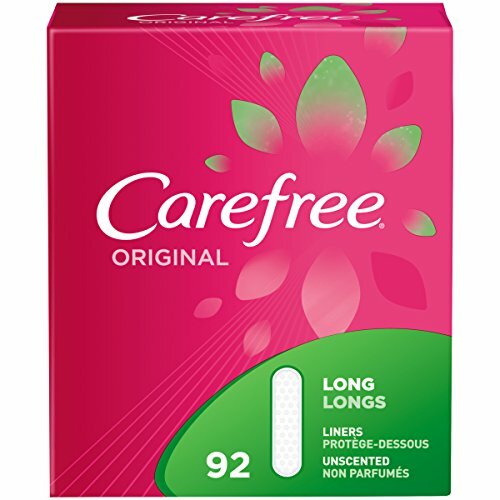 A bit more generous in length for more coverage, Carefree Original Long Liners have a rectangular shape, an incredibly soft cover, and handy stay-put adhesive to keep the liner comfortably in place. With trusted 3-in-1 protection for dryness, comfort and odor control, Poise Light Incontinence Pads now have a new ContourFit design to give you the confidence you need day or night for superior incontinence protection. The front and back of the incontinence pads are wider to provide even more coverage where you need it the most, while the middle features a soft curve that will better conform to your natural body curves. 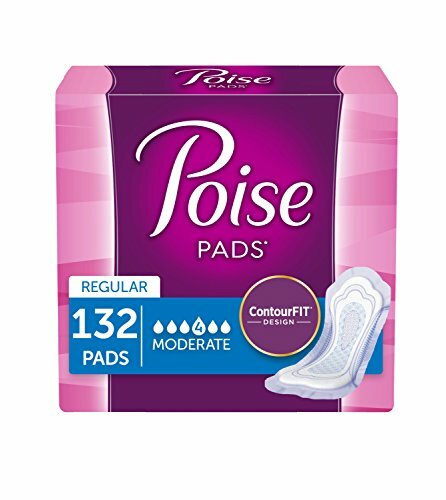 Poise pads fit you better than before and stay 10x drier than leading period pads. Poise Ultra Thin Incontinence Pads are designed to handle those unexpected bursts. This package contains individually wrapped Poise Light Absorbency Incontinence Pads in long length. Poise is the number one brand for light bladder leaks. Based on Nielsen Market Share Data Frequently Asked Questions What is LBL? LBL stands for Light Bladder Leakage, and it affects millions of women. In fact, 1 in 3 women experience Light Bladder Leakage (LBL). LBL is the frequent involuntary leakage of urine. Why do I have bladder leaks? Some of the most common reasons for uninvited leaks include: Physical changes from childbirth to menopause. Being overweight. Complications from surgery, stroke, or chronic diseases. Bladder or urinary tract infections. Bladder irritants. Can I prevent leaks? There are healthy habits you can maintain in order to help prevent leaks. Track your triggers Look for patterns in how your bladder reacts to certain spicy and acidic foods and beverages. Exercise regularly - Reduce leaks by strengthening the muscles of your pelvic floor. Drink more water Drink six to seven 8-ounce glasses of water a day to prevent irritation. Can I use my FSA? Yes, you can. Poise products are FSA-eligible only applicable in the US. Will my shipping box have what s inside written on it? No, it will not. All Poise maternity pads, bladder control pads and other incontinence products are shipped discreetly in a brown, corrugated box for your privacy. With trusted 3-in-1 protection for dryness, comfort and odor control, Poise incontinence pads for women give you the confidence and protection you need. Specifically designed to handle unexpected bursts, light absorbency Poise Ultra Thin Pads stay 5X drier than the leading period pads. Stay protected from light bladder leaks with Thin-Flex technology that allows the pad to move seamlessly with your body. Incredibly thin bladder control pads have an Absorb-loc core that quickly locks away wetness and odor to help keep you feeling clean and fresh. 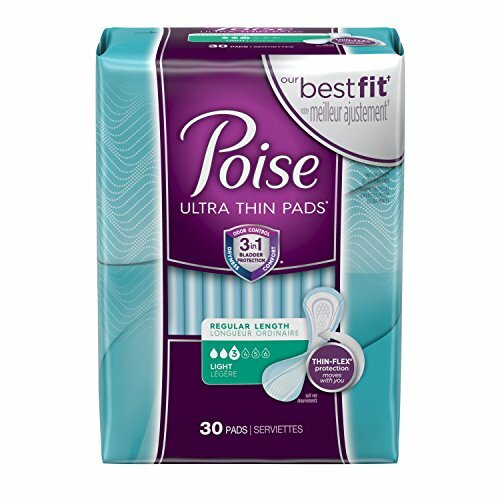 Poise Ultra Thin Pads are 40% thinner than Poise Pads, and are individually wrapped so you can tuck them discreetly into your purse, desk drawer or gym bag. Trust the number one brand for Light Bladder Leakage* to give you the confidence and protection you need. This package always ships in a discreet box for your privacy. *Based on market shareFrequently Asked QuestionsWhat is LBL?LBL stands for light bladder leakage, and it affects millions of women. In fact, 1 in 3 women experience light bladder leakage (LBL), which is the frequent involuntary leakage of urine. Why do I have bladder leaks? Some of the most common reasons for uninvited leaks include: Physical changes from childbirth to menopause. Being overweight. Complications from surgery, stroke or chronic diseases. Bladder or urinary tract infections. Bladder irritants.Can I prevent leaks? There are healthy habits you can maintain in order to help prevent leaks. Track your triggers Look for patterns in how your bladder reacts to certain spicy and acidic foods and beverages. Exercise regularly Reduce leaks by strengthening the muscles of your pelvic floor. Drink more water Drink six to seven 8-ounce glasses of water a day to prevent irritation.Can I use my FSA? Yes, you can. Poise products are FSA-eligible (applicable only in the U.S.). Will my shipping box have what s inside written on it? No, it will not. All Poise products are shipped discreetly in a brown corrugated box for your privacy. Incontinence can make it difficult to continue with your daily routine, but Tena has you covered with Ultimate Pads to protect you from heavy bladder leaks and surges. Tena Intimates Ultimate Pads protect against heavy surge incontinence to keep you dry and confident. With ProSkin Technology, Tena Intimate Pads protect against leaks, odor, and wetness to keep your skin dry and healthy. Try the discreet bladder leakage protection of Tena Intimates Ultimate Pads and get back to being you. Cushiony side gathers that conform to your body. 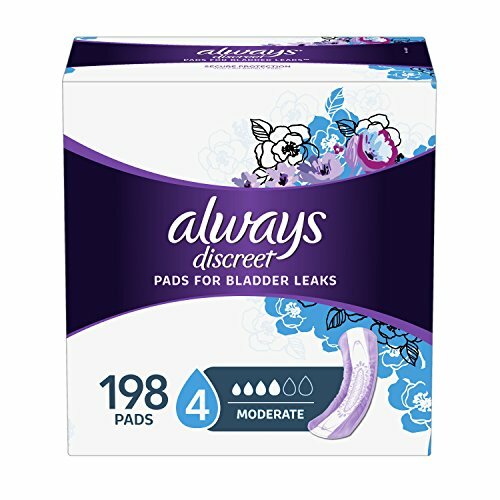 Get bladder leak protection you can depend on with Always Discreet Pads. These super absorbent pads have a RapidDry core that turns liquid to gel to help lock away bladder leaks and odors in seconds. With their thin design, you ll be able to walk with poise while keeping your incontinence protection discreet. 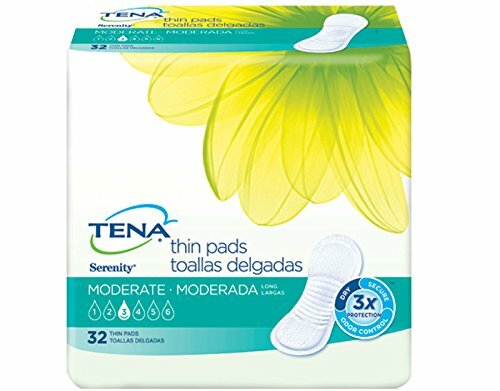 Enjoy powerful protection against light to moderate bladder leaks and surges with Tena Serenity Moderate Thin Incontinence Pads. A thin design offers comfortable protection so you can go about your day and not have to change your routine. A soft top sheet and super-absorbent Dry-Fast Core quickly absorb and lock in urine to keep you dry. Additionally, they are pH balanced to neutralize odor, not mask it. A longer length adds extra coverage where you need it most. 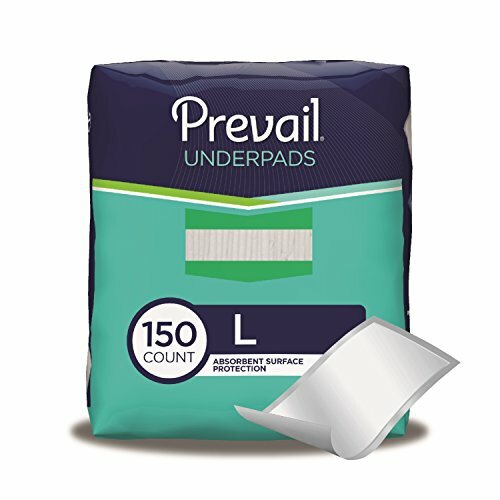 Prevail Fluff Underpads help protect beds, chairs, and other furniture from accidental spills for an additional degree of protection. Locking in wetness to protect surfaces, the moisture-proof barrier offers secondary protection, along with the use of protective underwear and briefs. Use overnight for extra strong construction that resists stretching and tearing even when wet. 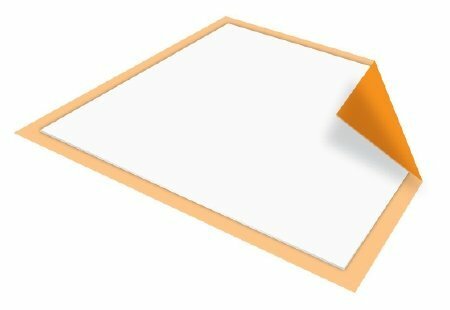 Place a pad on the furniture surface to expose the absorbent layer. Prevail adult care products are manufactured in Pennsylvania with attention to quality, safety, sustainability, and responsible sourcing practices by First Quality, a family-owned company. First Quality is a leader in developing premium quality products. In addition to our collection of adult care products, we also offer lines of baby products, feminine care, paper products, and bottled water. DURABLE CONSTRUCTION: Their extra-strong construction makes these underpads durable even when wet. They resist stretching and tearing and they're strong & absorbent enough even for overnight use. A poly backing grips surfaces securely to prevent sliding. Prevail is a leader in advancing new technologies for greater protection, comfort, and skin health and wellness. Our commitment to quality & innovation is evident in every product we make. Compare our superior comfort to similar products by Poise Pads, Always Discreet, Depends, Tena, Chux or Medline. Protect bedding and restore your confidence with Medpride disposable underpads that help keep you cleaner and drier throughout the night. When you or a child have an accident in bed, it can not only seep into the mattress fabric and bed sheets, it can irritate your skin and leave you feeling less than confident. That's why we developed Medpride Disposable Underpads that help protect your bedding, absorb liquids quickly to reduce irritation, and help you sleep a little bit better knowing you're protected all through the night. Designed with an ultra-absorbent fluff filling, these thick bed pads can be used by parents with young babies for quick changes, children who are just transitioning from diapers to underwear, adults who may be struggling with incontinence, or even by pet owners looking to train their dogs and keep floors a bit cleaner. Protect beds, floors, or puppy training crates with ultra-absorbent underpads from Medpride by clicking 'Add to Cart' above now. Advanced Bed Protection - These thick incontinence pads can help protect bedding and sheets from uncontrolled bladder or urinary problems in men, women, kids, or elderly to improve confidence and sleep. Super Absorbent Fluff Fill Layers - Medpride bed pads are designed with premium polymer layers that help absorb liquids, urine, or accidents more quickly, locking it away to help control odor and wetness. Multipurpose Support - Our urinary incontinence pads are not only great for young children or elderly hospice care patients, they can be used by pet owners who want to help home or crate train young puppies or support older dogs. 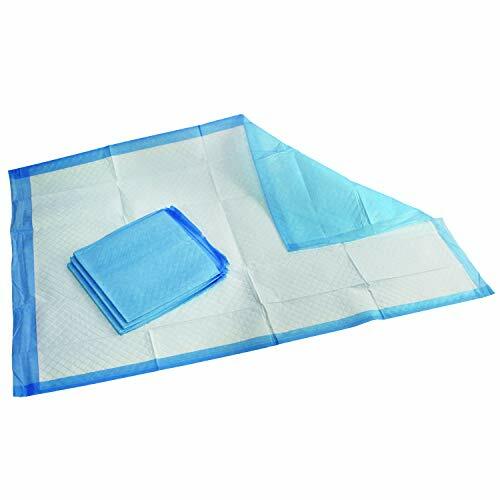 Avoid Messy Puddles or Irritation - Incontinence bed pads are designed to absorb liquids quickly and safely, which is important for minimizing skin irritation, keeping animals from tracking urine across the floor, or avoiding puddling. Large Bulk Count - Available in 25 or 50-count packages, our underpad bed covers can be used every night, while you're traveling, or anytime you need a little extra protection when you're sleeping. They're also disposable for quick clean up!